Congratulations to the winner of our Summer 2009 Photo Contest, Susanne Hartner of Germany! 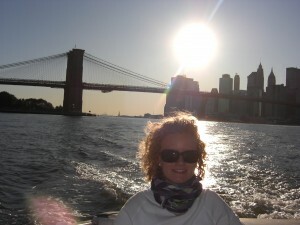 In this photo Susanne can be seen in front of the Brooklyn Bridge and Downtown NYC. Susanne writes of her time in the New York area, "Overall I had an amazing experience I would not want to miss!" As the winner of the Summer Photo Contest, Susanne will receive a check of $25 from InterExchange. Thanks to everyone who submitted photos! We'll be having another photo contest soon!